That is amazing hahaha. The game doesn't know how to handle it. Wow. This is really nice! "Help me study." Of course. If you want maximum drama, bring them both along during SSS, let them develop their relationship... then "sacrifice" Konstanten at the end. Edited by Tarlonniel, 05 October 2018 - 05:00 AM. Is this a SSS part? I can't believe they are actually doing something with the sidekicks. That's just adorable. Nice to see them developing the sidekicks more. I wonder what are the conditions to trigger it. I'll try to get it, but I don't want to change my party composition. FINALLY! More Konstanten Kontent! I approve this wholeheartedly. What about Tekehu? He's even more "anything with a pulse and maybe even not that discriminating" than Serafen. He is not in my party right now. But good question, what would he say in this conversation? The companions will have to behave properly now that you can take Vela with you. Interesting. I started a new game after being away a while, and where previously I got Tekehu's dialog very quickly after hitting +1, now I'm at +2, finished the first part of the quest with the watershapers and Delver's Row, and still not a peep Since I was away a while, not up to date on patch notes, did they change it that much? 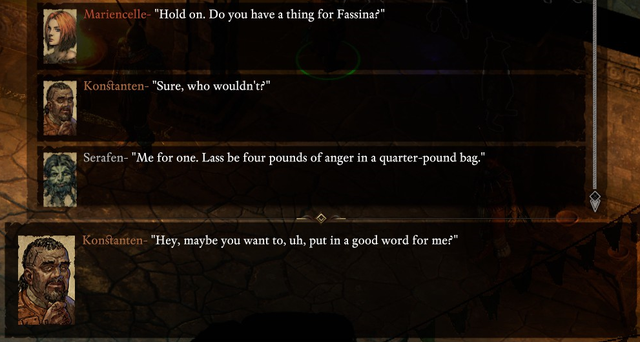 Yeah, made a new character as well and things seem to have changed - Serafen's and Eder's +1 and Aloth's -1 triggered as fast as usual, Tekehu's +1 dialogue never happened yet. Here's hoping it's not bugged, since I don't recall any patch notes regarding that. So out of curiosity, has anyone managed to figure out which quests need to be done to trigger any of the Tekehu rep dialog now? So far I've completed: The Delver's Row stuff, the Watershapers Guild, Motare o Kozi, and the Wahaki quests for the Huana faction without any dialog triggers, so I assume it's either bugged or after all of those. Although that seems like a lot of quests to go through for just the +1 rep conversation. Edited by Sylph_14, 20 November 2018 - 08:22 PM. So out of curiosity, has anyone managed to figure out which quests need to be done to trigger any of the Tekehu rep dialog now? So far I've completed: The Delver's Row stuff, the Watershapers Guild, Motare o Kozi, and the Wahaki quests for the Huana faction without any dialog triggers, so I assume it's either bugged or after all of those. I assume by "Delver's Row stuff" you mean that you completed the rogue watershapers quest from the prince, too? A few patches ago Tekehu's +1 triggered either after the "Kahanga Roaylty seem to be really taken with you" conversation or after finishing this quest. But I haven't touched the game since BoW's release so I don't know if this was changed. You assume correctly Completed the rogue watershaper questline, as well as the guild one with the dragon. I've noticed I'm not getting any of the dialog between companions, the ones that bring up the dialog box I mean. The ambient ones are still going off fine.